Enjoy fantastic views of Lake Garda as you explore the region around this famous lake on this self-guided cycling holiday. Visit Castle Buonconsiglio, Cavalgese di Riviera and the cities of of Trento, Verona, Brescia, and Mantua where you can soak up the art and culture. Relax by the banks of the emerald lake or cool off in its refreshing waters and in the evening enjoy a glass of wine or two, as this is one of the most famous Italian wine growing regions. Tour information and bike fitting. We recommend taking a stroll through the old town. The day starts with a transfer by minibus to Trento (old town with cathedral, castle Buonconsiglio). Then, you will follow the river Adige to Rovereto. 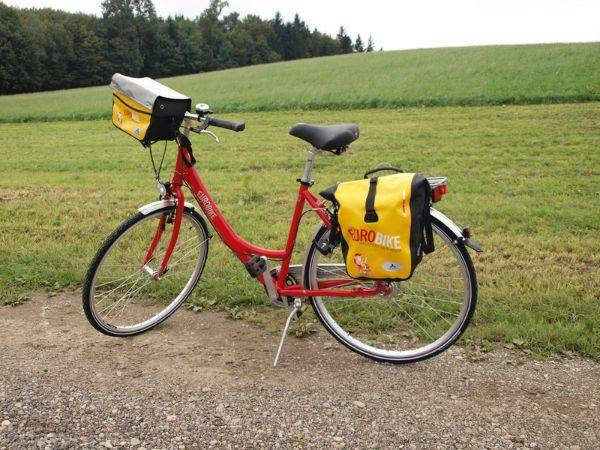 From here, you will cycle westwards in the direction of Lake Garda. In Mori you will try the world famous pistachio ice-cream in the Gelateria Bologna. After a short climb, you will cycle downhill towards the lake in Torbole and further to Riva. From here, a boat will then take you down the entire length of the lake and back to Sirmione or Desenzano. A minibus or train will take you to Verona. The city of Romeo and Juliet with its Renaissance palaces, the Roman arena and many cosy places invite you to stay for a stroll. Over gently rolling hills, past cypress trees and vineyards, the tour will take you back to the southern shore of the lake – for Goethe the lake was “a delicious spectacle”, for the Roman poet Catull “a shining star”. Beautiful trails will lead you along the river Mincio southwards to Mantua. The thousand-year-old town of the royal Gonzaga family impresses its visitors with its art and beauty. The Castello S. Giorgio and the Palazzo Ducale, the Piazza Sordello with the house of Rigoletto, the cathedral, the Piazza Broletto with the old city hall, the Piazza Erbe with the courthouse palace, the clock tower, the rotunda of San Lorenzo, and the Basilica of St. Andrew are worth seeing. The train will take you back to your hotel. Today, you will follow lonely roads, through vineyards, peach orchards and kiwi plantations to Solferino – the place, where Garibaldi united Italy in the famous “Battle of Solferino”. On your way back to Lake Garda, you will cycle through the area where the delicious wines of Lugana are grown. Today, you will ride your bicycle along the lake shore towards Cavalgese di Riviera and get some unforgettable views of Lake Garda. Then, you will follow the Naviglio Grande Bresciano (canal with bike path) to Brescia – a city of Roman origin with many more places of interest. The train will take you back to Sirmione. The route is flat to slightly hilly. 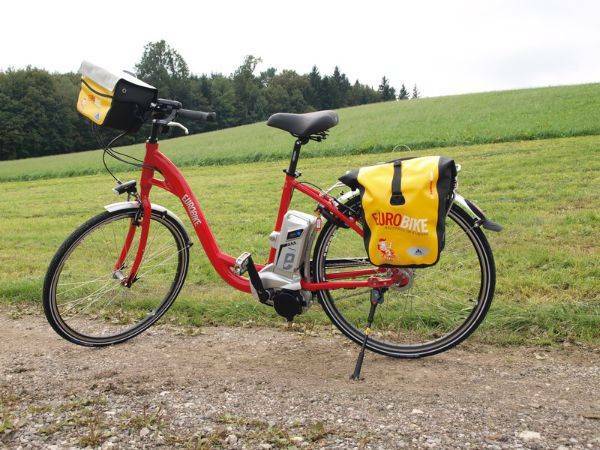 You will cycle on bike trails, side roads, and sometimes on country lanes. Only short sections have to be cycled on roads with more traffic, especially when entering or leaving cities. 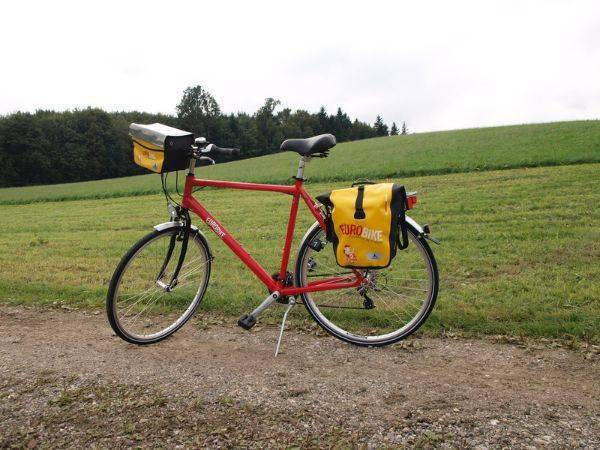 We recommend flying to Milan region airports to reach the starting point of this cycling holiday. Hotel Lido International: Arrival at Desenzano del Garda, the train station is approx. 1,5 km away from the Hotel Lido International. Taxi fare approx. € 8,-. Hotels Blu Lake and Suisse: Arrival at Desenzano del Garda, the train station is approx. 8 km away from Sirmione. Taxi fare approx. € 26,-. 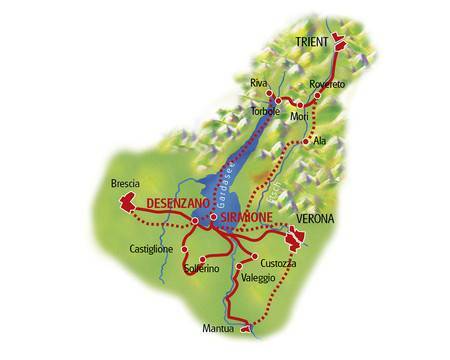 The journey from the train station to Sirmione is also possible by bus – line SAIA Verona/Brescia, costs approx. € 5,- / person. Bergamo Orio al Serio: The airport is about 15-20 minutes away from Bergamo station. A taxi costs about € 30,- or take bus no. 1, which costs € 7,-/person. Info: www.atb.bergamo.it . Continue by train to Desenzano del Garda. Journey takes 1,5 hours (costs € 8,- - € 20,-/person). Milano Linate: There is the Star Fly airport bus that goes every 30 minutes to the main station (Milano Centrale). It costs € 10,-/person and takes 25 minutes. Taxi to the station costs € 20,-. Continue by train to Desenzano del Garda. Journey takes about 1,5 hours (costs about € 8,- - € 20,-/person). Milano Malpensa. There is a shuttle bus Milano Centrale station every 20 minutes from the airport (costs approx.. € 10,- per person, takes about 1 hour). The train “Malpensa Express” departs every 30 minutes to Northern train station Nord-Cadorna Milano (takes approx.. 40 minutes). You can find further information at www.ferrovienord.it/webmxp (costs approx. € 12,- per person). Taxis can be found outside the arrival halls in terminals 1 and 2 (cost to train station approx.. € 80,-). Continue by train to Desenzano del Garda station, takes approx.. 1,5 hours (cost approx.. € 8,- - € 20,-/person). Verona – Catullo. Take the ATV bus (http://www.atv.verona.it/flex/cm/pages/ServeBLOB.php/L/EN/IDPagina/1 ) from the airport to the train station Verona Porta Nuova (Cost approx. € 8,- / person, journey time approx. 15 minutes). By train to Desenzano (cost approx. € 10,-, journey time approx. 20 mins). Venice – Marco Polo. By shuttle bus (ATVO – http://www.atvo.it/it-venice-airport.html ) from the airport to the train station Mestre (cost approx. € 6,–/person, journey time approx. 30 minutes). Continue by train to Desenzano (cost approx. € 10,- to € 20,-/person, depending on class and connection, journey time approx. 1.5 hour). Treviso – Canova Airport. By shuttle bus (ATVO - http://www.atvo.it/it-treviso-airport.html ) from the airport to the train station Mestre (Cost approx. € 10,- / person, journey time approx. 1 hour). Continue by train to Desenzano (cost approx. € 10,- to € 20,-/person depending on class and connection, journey time approx. 1.5 hours). The Lake Garda - One Hotel cycling holiday includes the daily transfer of luggage to the next hotel and local support if required.